Portrayers: Nicole Catalanotto, September 7, 1978 - January 30, 1981. Dana Klaboe, March 10, 1981 - March 13, 1986. Sandra Ferguson, August 13, 1987 - June 15, 1993; March 13, 1998 - June 25, 1999. 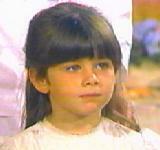 Christine Tucci, July 13, 1993 - July 5, 1995. Laura Moss, December 25, 1996 - March 3, 1998. Introduction Scenes: (Sandra Ferguson, 1987) The docks, to Matthew's dog, then to Matthew Cory, "Apple! Look at you! You're all fixed up!... Matthew! Give me a hug, you jerk!" (Christine Tucci) Walking into the Cory Mansion, "Hi! Anybody home?" (Laura Moss) The Cory Mansion living room, to Rachel Cory, "Merry Christmas, Mom." (Sandra Ferguson, 1998) The Cory Mansion front door, to Sofia Carlino, "Uh, fine, fine. Do you want to tell me what I've missed? Is there something going on here?" Exit Scenes: (Dana Klaboe) In the Cory Mansion living room, to Ada Hobson (RIP) and Rachel Cory, "Good night." (Sandra Ferguson, 1993) An airport restaurant, to Grant Harrison, "Thank you for listening." (Christine Tucci) The Cory Mansion foyer, to Ryan Harrison and Vicky Hudson, "Bye." (Laura Moss) Being ignored by Carl and Rachel Hutchins in the Cory Mansion living room. (Sandra Ferguson, 1999) At the end of Cass Winthrop and Lila Roberts' wedding celebration in Foster park, "So I guess this is it." Birthday: (Former) August 11, 1978. (Current) May 15, 1969. Other Aliases: Amanda Davis Cory (full name). Mandy Ashtin (alias). Hadley Prescott (alias). Named after Mac Cory's mother. Other Whereabouts: Los Angeles, California. Europe. Amanda was born premature and spent her first few weeks in an incubator. In 1990, depressed over her recent divorce, Amanda began drinking more than was good for her. However, she was able to quit by the end of the year and never became an alcoholic. She was caught in a building explosion in 1993. In November of 1994, Amanda was in a car accident with Evan Frame which left her paralyzed. After four months of physical therapy she was able to walk again. Since 1987, Amanda has been an integral part of Cory Enterprises. She started out as a reporter and till 1999 would often pen an article herself. She was at one point CEO of Cory Publishing, a top-level position giving her a say in the conducting of business. In 1995 she left to help run the Los Angeles branch of Cory Publishing, but returned at the close of 1996. Amanda was the editor of Sophisticate, although the magazine has not been mentioned in years. In 1997 she joined The Herald as a reporter.